On January 11th, I played the first Treasure show of 2018. Treasure is a monthly ambient series at Howlers put on by Manny Theiner (Futurism) and his fellow DJ Elizabeth (Amadea). I was supposed to play one earlier, but this one was probably the best for me anyway. I left my house with a lot of time to spare. I put all my gear in a box, and, unfortunately, it started to rain soon after I started towards the venue. All of the musick gear was protected with various towels, but the box started to fall apart. Luckily, my friend Anna saw me walking and gave me a ride to Howlers. Howlers was all dressed up for the show. The tables were covered by black tablecloths and little jewels were strewn about on top. Because this was my first Treasure show, I didn't expect anything like that. It is a nice touch. I played first after some chilly post-punk and industrial DJing by Amadea and Futurism. I used a stripped down setup of only 3 pedals and the microKorg. It was nice to bring back the Boomerang Phrase Sampler Plus, and the other two, DOD Carcosa Fuzz and Strymon El Capistan dTape Echo (what a mouthful of jargonese), both fairly new, worked well together. A guy in a YouTube guitar video would say something about how I was able to "keep my tone", far off from the muddy sounds of slightly older Satyr/Elfheim material, and then play a really boring blues solo. I played some exciting blues solos during the soundcheck, though the actual set was ambient and textural, little crystals of the night among an unfulfilled sound of mystery. I continued to build the crystal notes with bass counterpoints. The song never reached that unfortunate lazy noise end that has occurred too often in the past. Instead, it ended with a few springy guitarings. 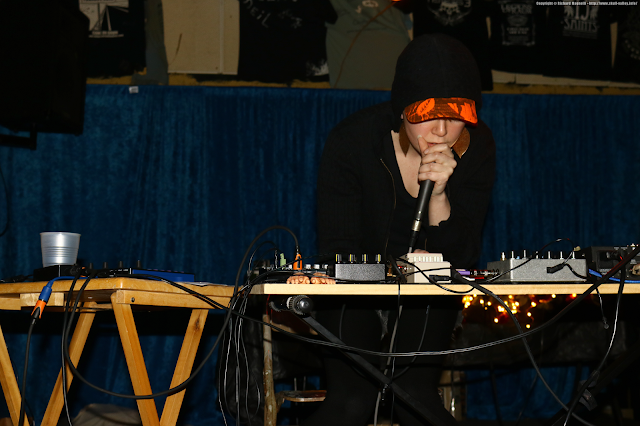 The next song incorporated the microKorg with minimalist drums and vampire bells. A foreboding bass sound provided the backdrop. That one ended with a choir and morphed into the "swamp-tone" (nothing to do with Swampwalk) that I use often, and that morphed into a whirl of notes. The final section was very quiet. I got a lot of compliments on my set, and I really liked it too. It was one of the best I have ever played. Next, there was more DJing for a bit. Then Swampwalk played. Her set was really good! I mean, Swampwalk sets are always good, but the sound was very full this time. The chiptunes sounded bright and clear. She was also very emphatic with her vocal delivery. I love the vast swings of emotions of these songs, true peril and joy. More DJing commenced, and that was it. I got a ride home from Elizabeth, thankfully avoiding the rain this time. I hope to go to more of the Treasure shows (Treasure #11 happens February 8th featuring slowdanger and Trovants). I also have a better idea of what to do with future Satyr/Elfheim sets, though they may still remain somewhat rare for the time being.